Apple has rolled out the second minor iteration of its newest mobile operating system iOS 9, which fixes the iOS lockscreen vulnerability. The widely publicized LockScreen bug allowed anyone with physical access to your iOS device running iOS 9.0 or iOS 9.0.1 to access all the contacts and photos without unlocking the device. According to an update on Apple's support website, the iOS lockscreen issue was the only security bug fixed in the latest iOS 9.0.2 release. 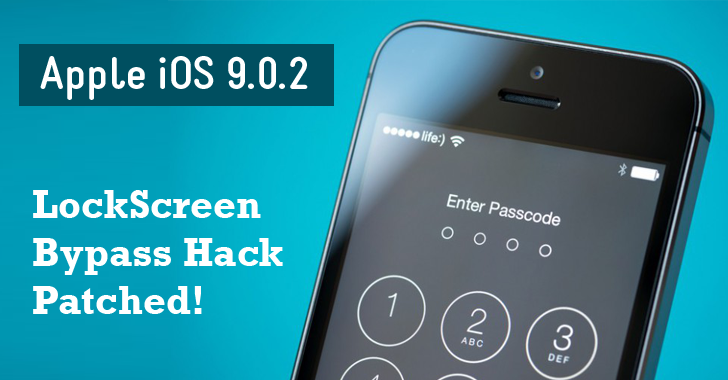 Last week, iPhone user Jose Rodriguez published a "dead simple" method to bypass lock screen of the devices running iOS 9 and iOS 9.0.1. Using the benevolent nature of Apple's personal assistant Siri, anyone with physical access to the device could gain access through the lock screen. However, Rodriguez confirmed the flaw was fixed in iOS 9.0.2. If you haven't updated your iPhone, iPad or iPod touch devices to iOS 9.0.2 yet, you can download the update right by going to Settings –> General –> Software Update on your iOS device and tapping on the 'Download and Install' button.